“I use monochromatic colouring to give the audience fresh ideas. The texture supports the subjects and backgrounds and the figures are distorted, which aims to let people see a different reality. I want people to feel a sense of peace, calm, stability and tranquility. Yan Naing Tun was born in 1979, the third son in his family, and brought up in a small fishing village. After finishing high school, he moved to Yangon and entered the University of Culture in 1998, earning a B.A (Painting) degree in 2002. Now he is living in Yangon working as a professional artist. He participated in his first group show in Yangon in 2004 and since then he has been involved in a series of exhibitions in Burma. He gained ‘Special Prize’ for the best of the year in Myanmar’s annual Tun Foundation Art Competition in 2009. This current monochrome series has resonated with collectors from around the world, with its poignant scenes from everyday life in Yangon. The works capture people in the most humdrum circumstances – in the teashop, at the bus-stop, waiting at the hospital. Yan Naing Tun’s artistic imagination subtly alters this reality, rendering it in monochrome, which banishes the banal and makes us look at these everyday scenes afresh. During the last nine months as Burma has started to reform and liberalize, Yan Naing Tun has added color to some of his artworks. He also features newspapers – either as background collages or depicted realistically with his characters reading them during their everyday life. He says he fells that ordinary people are deeply interested in the news these days, avid to read how change is coming to Burma. 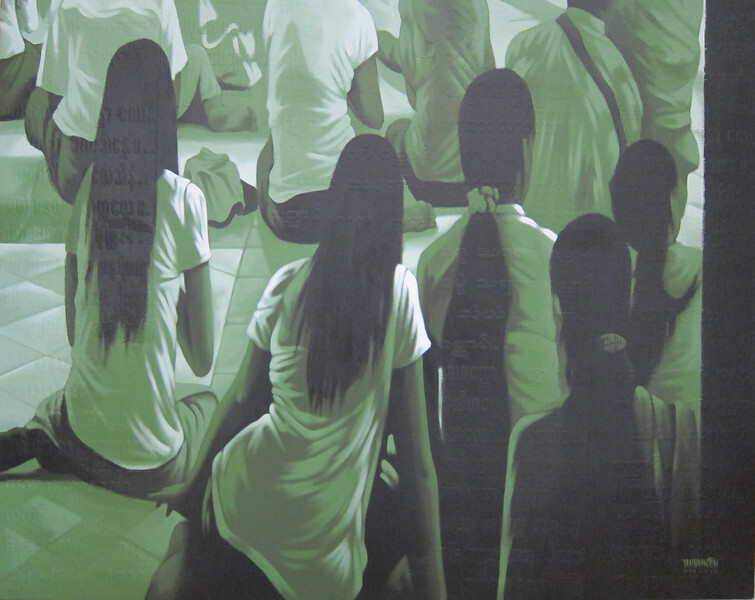 Yan Naing Tun, Girls at Worship, 2012. Acrylic on canvas, 51 X 41 in.